This week I started a new book as I rode the métro to and from my AQM puppetry worshop. My wife bought the book a few months ago, but only when my friend Wilfred read it and told me how good it was did I decide to read it. 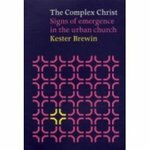 The Complex Christ : Signs of Emergence in the Urban Church (by Kester Brewin) is EXCELLENT. So much so that I want to blog it for a while, with the intent of making you want to read it or giving you a few of the ideas that are within. – The stages, like any linear ideology, are pretty simplistic, though helpful. Having read the book I appreciate his complexification into a cyclic phenomenon of climbing one peak so that we can climb back down and go up another, and in reading we must keep in mind that the stage theory can only be used as a tool for understanding states of mind, not as an absolute model for the “spiritual progression” of every individual. – I think one difficulty comes when we start talking about “stage four.” I believe Curieux was started on the basis of this “stage.” One thing the book doesn’t go into and I think it was smart not to do so was: how far does the “self-reflectiveness” go? Curieux has often been challenged with respect to what it has kept and what it has let go; what do we believe is essential? This is a very nebulous area and the greatest difficulties arise when some are questioning some aspects and others are questioning other aspects. What is sacred? What must not be touched? These are difficult questions, and I don’t believe that any select group can decide for the whole, but that each must go through their own process of questioning, otherwise it simply builds another “club” centered around loyalty to a doctrine. Using the model of the 6 stages I believe that although people may have begun questioning certain aspects of their traditional heritage they may not be comfortabe with questioning the whole. I think that the model of climbing and descending mountains can happen many times within stage four. It is easy to stop at a certain point of questioning and remain there, believing that no more change is necessary. – Brewin says that the only way to change effectively is to “let the evolutionary forces of our local urban situations bring a new mode of being to birth.” This is a tall order. There are few in the Christian world who are willing to explore the “local urban situation” to any full depth. In general we still set ourselves limits that cut us off from understanding our own similarities with the rest of the supposedly “non-christian” population, to an extent that we will never be able to relate with it. It requires an immense openness in order to go beyond the age-old view of the city as detrimental to human existance. I was highly interested in Brewin’s remark on the fact that God intends to build a “new Jerusalem” (i.e., a city) not a new eden. It is surely an interested read that I will pursue. Thanx for the “lead on the read”. To comment on your observations and the author’s comments, I understand universalizing, I am at a place where I understand God less and less as a unique priviledge of the Christian. I am beyond Christian even, I mean did Jesus say: “Start a religion and call it Christian”? There is one creator who is available to all, no matter who they call themselves or who they are. The language they use to comprehend this creator is irrelevant if the fundamentals, such as a worship in spirit are present in the person’s soul.